More important developments are occurring inside Europe, and these recent developments reveal that the fractures within the EU are continuing to expand. It is clear that the EU’s nations are steadily dividing into rival blocs, and they do not have a shared vision for the future of Europe or the EU. The first event that is worthy of attention is that Germany and France have signed a bilateral treaty of alliance between their nations. The first link notes this includes closer cooperation at the UN, having their populations become bi-lingual in both German and French and having a common military policy to develop an EU army. It is very noteworthy that at the signing of the treaty, no EU official was participating in it. Indeed, EU Council President, Donald Tusk, is quoted in the first link as sounding less than enthusiastic about this private German-French deal. Regarding immigration, it may be that Germany and France are going to “go it alone” as “Central and Eastern European states have refused to accept German and French leadership on migration.” The link also observes that Poland and Italy are creating a common “axis” to rival the Franco-German “axis” within Europe. The second link offers a German media perspective on this Franco-German alliance, and it offers more specific details about the areas of heightened cooperation that are called for in this new alliance. It must be pointed out that the French and German leaders are making this new agreement when both are in positions of weakened political power domestically. Merkel was forced into relinquishing her political party leadership position after it lost badly in recent German regional elections, and Macron’s popularity in the French polls has plummeted as he is struggling to cling to power in the wake of organized and continuing opposition to him via the “yellow vest” movement within France. Macron would almost certainly lose an election in France if one were held today. Why are Germany and France taking this action? They are already pledged to help defend each other via their NATO commitment, and any creation of an EU army would dilute the strength of NATO within Europe. I think there is one possibility for this bilateral action that the media is not considering. 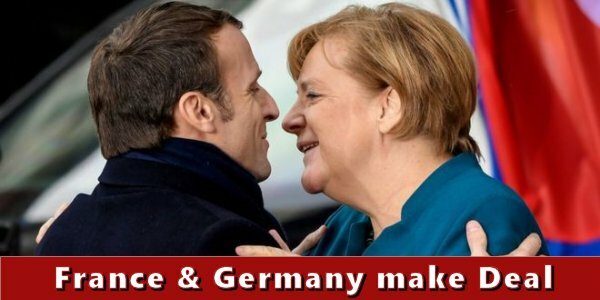 With the UK leaving the EU in some kind of Brexit, and with more fractures appearing within the EU, the globalist German and French leaders may be creating a fall-back “axis” to which they could add other sympathetic nations if the EU does come unglued. There is clear evidence in the third link, fourth link and fifth link that internal cohesion within the EU is splintering. The nations of Italy and Poland, whose leaders are nationalists, are openly calling for the creation of a Polish-Italian axis to rival the Franco-German axis in creating Europe’s future. This rivalry will be intensified as the EU holds its European Parliamentary elections this Spring. The third link relates the efforts of Italian and Polish leaders to create a pan-European nationalist/populist alliance to rival the EU globalists. Reportedly, the populist parties within France and the Netherlands have already agreed to join this Euro-skeptic alliance, and Austria, Hungary, the Czech Republic, and Slovakia are also prime candidates to join this alliance. Indeed, Macron is so unpopular within France that if early elections were forced, the Euro-skeptic party (which finished second in the most recent French election) may take power in France. If that occurs, a new Euro-skeptic government in France could easily repudiate the Franco-German globalist pact that was just inked by Merkel and Macron. The link further warns that these current struggles “threaten to split the EU down the middle between Euroskeptic nationalists and Europhile globalists.” The fourth and fifth links contain additional details about this Euro-skeptic bloc forming within the EU itself. The sixth link adds that the former Euro-skeptic leader of Italy, Silvio Berlusconi, will also run in the upcoming EU parliamentary elections. Clearly, a battle is shaping up within the EU which could tear the EU, as we know it today, apart. The more that Merkel, Macron and the EU leaders push for European nations to yield their sovereignties to the EU, the more nationalist/populist push-back they create among the EU nations. The Bible contains an apt commentary on human behavior which increasingly applies in this internal EU struggle. It is found in Amos 3:3 and it states: “Can two walk together except they be agreed?” It is very clear that the nations within the EU are not at all “walking in agreement” regarding the future of Europe, which indicates that at some point a clean break will occur within the EU and we could see a new realignment of European nations into separate (and rival?) alliances. Any break-up of the EU would almost certainly require a rearrangement of which nations would stay in the Euro bloc and which would adopt their former national currencies or even form a new one to be used in common. A threat to the integrity and future of the Euro currency could easily create a global currency crisis as it would put at risk so many counter-party financial and banking deals involving the Euro currency among Eurozone and non-Eurozone nations alike. The global derivatives market is so massive that if a divisive split within the EU resulted in derivatives deals “going bad,” it could cause a global financial crisis. Just such a crisis is prophesied in Revelation 17-18 to occur in the latter days. While we do not yet know what the precipitating “trigger event” will be that creates the global financial crisis, the prophecy indicates it will be a severe one. Revelation 17 foretells that the reigning global financial/monetary system (clearly the globalist institutions, banks, etc.) will be forcibly overthrown by a cryptic alliance called “the seven heads and ten horns” in Revelation 13 and 17. Revelation 17:16 uses prophetic language which strongly infers that the overthrow will be done with extreme prejudice. Revelation 17:16 states; “And the ten horns…these shall hate the whore, and shall make her desolate and naked, and shall eat her flesh, and burn her with fire.” The “great whore” is another name for the global system called “Babylon the Great” in Revelation 17-18. The wording of this prophecy could mean that the rebelling “seven heads and ten horns” will expose all the corruptions of the globalists’ insider system, seize their assets and destroy any chance of their making any come-back. I have usually regarded this language as having such symbolic meaning, but as the rivalry between the incumbent globalist system and the rival nationalist/populist nations grows more acrimonious, wars and bloodshed cannot be ruled out. In 2008, the global financial/banking crisis at that time came “within hours” of an international banking system collapse (seventh link). The banking system was then saved only by extraordinary actions. Our current global financial/monetary system has already been to the brink of collapse. Revelation 17-18 foretell that a future global banking/financial/monetary crisis will occur in which the current global system will crash instead of being saved. The growing political civil war within the EU increases the chances of the prophesied events in Revelation 17-18 coming to pass in the years ahead of us. As long-time readers of my blog know, I “set no dates” regarding when major biblical latter-day prophecies will be fulfilled, but it is clear that modern events are drawing us nearer to historic prophetic fulfillment. For more detailed information on the above topics, please read my free articles, Is Babylon the Great about to Fall…Ushering in a New Beast System?, The Babylonian Origin of the Modern Banking System, Are We Living in the Biblical “Latter Days?” and Should Christians Prepare for Future Hard Times?